As the flagship of Marvel’s “Ultimate” line-up, Ultimate Spider-Man is something of a trendsetter. It’s by far the most consistent of the imprint, with nearly double the issues of launch-mate Ultimate X-Men, and has only recently shifted creative teams, where UXM is on its fourth writer and umpteenth artist. The storytelling has had its peaks and valleys, but has never skimped on character development or action, and is always reaching to connect its world with that of the rest of the Ultimates. Brian Michael Bendis uses this issue almost exclusively for that final purpose. Spider-Man never appears in the book, and Peter Parker only makes a cameo – but you barely notice. The title’s supporting cast and antagonists are so deep and well developed that they can support an entire issue by themselves, and this story is all the proof you need. Even since the first issue, Bendis has had a major hard-on for Norman Osborn, the Green Goblin. He’s missed with a few storylines here and there, introduced a few awkward personalities, but when he’s dealt with the elder Osborn it’s been consistent quality. That trend continues throughout this story, which focuses almost exclusively on the Goblin. He blends intense action with intricate scheming and manipulation, but the issue doesn’t feel jerky or overly complex. It’s smart, the pacing is top notch, and it left me immediately craving more. 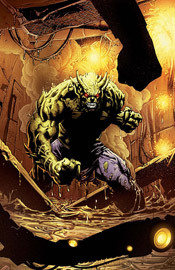 Bendis has frequently stated that he likes to develop a character, drop them into a situation and allow their personalities to take over from there, and that’s exactly what he does with Norman here. He’s a great character, he’s in a great environment, and he’s in the zone throughout this story. I had a major hang-up over Mark Bagley leaving this title, which he’d helped Bendis to get off the ground over a hundred issues prior. He’d invested so much of himself into the characters, the storytelling, the world, that I had an extremely hard time imagining anyone who could fill his shoes. Fortunately, Stuart Immonen is doing everything in his power to make me forget about the past and look forward to the future. In his first two (and a half) issues on USM, he’s repeatedly knocked the ball out of the park – retaining much of the simplicity and innocence that Bagley had developed, but adding a twinge of reality and combustibility to the mix. Immonen’s artwork in this issue is staggeringly good. He offers an ability to combine the everyday with the extraordinary, which grounds his tales in reality without sacrificing the over-the-top action that is typical of a good superhero book. His compositions are incredible, almost photographic – a panel on page four displays a simple explosion in a large government building, and nearly leaps right off the page into the reader’s lap. He knows when to detail a backdrop and when to simplify it, when to paint a panel with shadows and when to bathe it in light. He’s a marvelous replacement, and I can only dream he’ll have a run half as long as Bagley’s. When it’s on target, this is one of the best books in the industry, and it’s currently delivering one of the strongest stories of its entire run. Bendis’s writing has been invigorated by the change in artists, Immonen is producing the greatest work of his career, and the cast of characters has never been better. You need to buy this, it’s seriously some of the best stuff I’ve read this year.